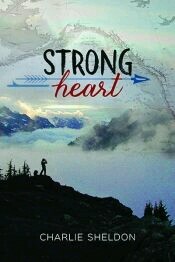 Strong Heart by Charlie Sheldon is a fictional story about a teenager, Sarah, who is reunited with her grandfather, Tom. There are other things happening in the story – Tom and his friends are trying to save land from developers so they are going on a hiking expedition. Sarah joins the group and has a vision that alters everything that she believes. The characters discuss the origins of man, ice ages and who has been where the longest. The characters discuss the origins of man, ice ages and how people came to different places. I thought that this was interesting. The story that followed this discussion was enjoyable. The book begins with no back story. Basically, you’re being thrown into a scene without knowing what’s going on at all. The details come out a little at a time. For most of the first few chapters, I feel a little lost. The dialogue seems a little stilted or forced, except in the part with Sarah’s vision. I think that the author was more comfortable telling the story while having a character tell a story. It seemed like when the author wanted to tell the story, it was awkward and rushed with either too many or not enough details. There’s a section where Myra and Eye, two of Tom’s friends, are discussing the tribe. I felt lost again because there were so many details to absorb in a few paragraphs. I wasn’t sure how it related to the story of Tom and his granddaughter. It makes sense later in the book. A large part of the book is Sarah’s vision. When she starts telling the story, I didn’t think it would mesh. It ended up being my favorite part of the book. In my opinion, the book could have been entirely about the vision. I won’t tell you the ending but it was not especially satisfying. I felt like I didn’t have any answers. I would give this book three stars. It was not my favorite book. It has potential but it needs a little work on the dialogue and the first chapter. *I received an ebook in exchange for a review on the Onlinebookclub.com.